آرون کارتر (اینگیلیسجه: Aaron Carter) آمریکالی موغنی, فیلمین سناریو یازاری, رقاص و اوْیونچو. ۷ دسامبر ۱۹۸۷ ‏ ایلینده آمریکادا دۆنیایا گؤز آچیب. 1997–گۆنوموز ایللر آراسیندا سینما ساحه‌سینده چالیشیب. During this time he also released some music online, including the single "Dance with Me" featuring Flo Rida in an attempt to kickstart his music career again. On August 22, 2010, Carter performed in Lake Ronkonkoma, NY at a benefit concert for Audrianna Bartol, a 3-year-old stricken with Stage 4 neuroblastoma cancer. On January 23, 2011, Carter's manager Johnny Wright announced that Carter had entered a treatment facility "to heal some emotional and spiritual issues he was dealing with." After entering the facility, Carter's first message to his fans was, "The main thing in life is not to be afraid of being human." On February 10, 2011, it was announced that Carter had successfully completed a month of rehab at the Betty Ford Center in Rancho Mirage, California. Carter was scheduled to perform a second benefit concert for Audrianna Bartol on February 5, 2011 in Lake Ronkonkoma, NY and a benefit for the activist organization, "Four Years. Go", was originally scheduled for February 24, 2011 in Manville, New Jersey. The Manville show was rescheduled to take place on March 24, 2011. On September 2, 2011, Carter performed a show at the Eagle Ridge Mall in Lake Wales, Florida. On November 7, 2011, Carter began starring in the Off-Broadway production of the world's longest running musical, The Fantasticks, at the Snapple Theater Center in New York City. Carter has been cast in the روْل of Matt, the play's central character. In January 2012, Carter was one of eight celebrities participating in the Food Network reality series Rachael vs. Guy: Celebrity Cook-Off. He was eliminated in the first episode. Throughout 2012, Carter made several one-off performances. On January 12, 2012, Carter performed a concert at Showcase Live in Foxborough, Massachusetts, and on January 19, 2012, he performed another concert at the Gramercy Theater in New York City. On May 11, 2012, he performed an acoustic show at the Mohegan Sun casino in Uncasville, Connecticut. Carter hosted a Ryan Cabrera show on May 30, 2012 in Flemington, New Jersey, and performed at Mixtape Festival on August 17, 2012. In 2013, Carter kicked off his first tour in eight years, the After Party Tour. The tour ran from February to December 2013 and included over 150 shows in the United States and Canada. ↑ AudriannaBartol. Angela Bartol (AudriannaBartol) on Twitter. Twitter.com. یوْخلانیلیب2011-04-11. ↑ Fleeman, Mike (2011-01-23). Aaron Carter Enters Treatment Facility. People.com. آرشیولنیب اصلی نۆسخه‌دن on March 28, 2011. یوْخلانیلیب2011-04-11. ↑ Twitter / AARONCARTER: The main thing in life is not. Twitter.com. یوْخلانیلیب2013-01-10. 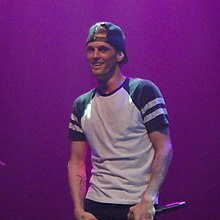 ↑ Aaron Carter (2011-02-10). Aaron Carter Out of Rehab, Back on Music Journey. E! Online. یوْخلانیلیب2011-11-27. ↑ Reinstetle, Matt (2011-09-02). Aaron Carter Entertains at Eagle Ridge Mall; Former Teen Star Showing Growth. TheLedger.com. یوْخلانیلیب2011-11-27. ↑ The Fantasticks Welcomes Aaron Carter Nov. 7 Off-Broadway. Playbill.com. آرشیولنیب اصلی نۆسخه‌دن on November 12, 2011. یوْخلانیلیب2011-11-27. ↑ Rachael vs. Guy Celebrity Cook-Off on Food Network - FN Dish – Food Network Blog (July 29, 2011). 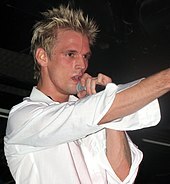 ↑ Aaron Carter | Foxborough Art & Entertainment, Food & Drink, and Music Events on Patch – Foxborough, MA Patch. Foxborough.patch.com (2012-01-12). یوْخلانیلیب2012-02-01. ↑ The Fantasticks' Aaron Carter to Go It Solo at Gramercy Theatre in January. Playbill.com. آرشیولنیب اصلی نۆسخه‌دن on November 13, 2013. یوْخلانیلیب2012-02-01. ↑ Archived copy. آرشیولنیب اصلی نۆسخه‌دن on June 4, 2012. یوْخلانیلیبNovember 13, 2013. ↑ Brown Paper Tickets. M.bpt.me (2012-05-30). یوْخلانیلیب2013-01-10. ↑ Salazar, Andrea (January 14, 2013). Aaron Carter announces After Party Tour. Hypable. آرشیولنیب اصلی نۆسخه‌دن on March 31, 2013. یوْخلانیلیبMarch 31, 2013. اینگیلیسجه ویکی‌پدیاسی‌نین ایشلدنلری طرفیندن یارانمیش«Aaron Carter»، مقاله‌سیندن گؤتورولوبدور. ( ۲۲ ژانویه ۲۰۱۸ تاریخینده یوْخلانیلیبدیر). قارداش پروژه‌لرده آرون کارتر گؤره داها آرتیق بیلگی‌لر تاپابیلرسینیز. Aaron Carter and Pat SoLo Performing \Ooh Wee\" - Photo by Peter Dzubay.png"